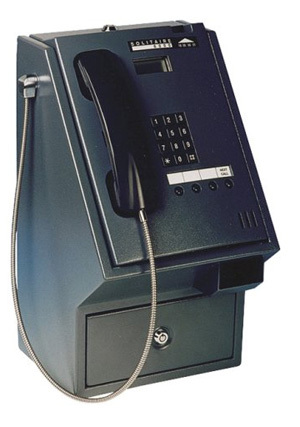 The Solitaire 6000HS payphone is designed for unsecured outdoor locations, and offers all the facilities of the standard Solitaire 6000 in a strong steel enclosure. This high security version has a 1200 coin cashbox capacity, useful for very busy sites, and a fully armoured handset cable. THE SOLITAIRE 6000HS IS THE MOST RELIABLE AND DURABLE PAYPHONE AVAILABLE IN AUSTRALIA. THE SOLITARE PAYPHONE HAS ALL THE MOST "UP TO DATE " FEATURES AND PROGRAMS AVAILABLE SUCH AS BEING ABLE TO OPERATE THROUGH A PABX SYSTEM, OPERATE ON A METERED LINE OR ON A NORMAL LINE, WIRELESS CONNECTION IF REQUIRED, CAPABLE TO PROGRAM A NEW COIN WITHOUT CHANGING THE BOARD, COMPARED TO OTHER PAYPHONES WHICH ARE AVAILABLE IN AUSTRALIA. A.W.P HAS INSTALLED THE SOLITAIRE 6000HS PAYPHONE TO MOST MAJOR PUBLIC FACILITIES INCLUDING HOSPITALS, COURTS, RESORTS, HOTELS, MUSEUM, CLUBS, AGED CARE FACILITIES, GOVERNMENT DEPARTMENTS etc. THROUGHOUT AUSTRALIA..
THREE MEMORY BUTTONS - COULD BE PROGRAMMED AS SPEED DIAL TAXI BUTTON. OPERATES ON 12 kHz (option) OR NORMAL LINE. LCD HAS GRAPHIC MESSAGES WHICH DOES NOT RELY ON LANGUAGE. ELIMINATE NEED FOR A ANOTHER TELEPHONE LINE/ TAXI PHONE BUTTON.